Today, I am going to start by sharing a few t-shirt refashions I have done recently. A friend of mine gave me this old Vans shirt, which I previously used the back of to make my sons Halloween costume. 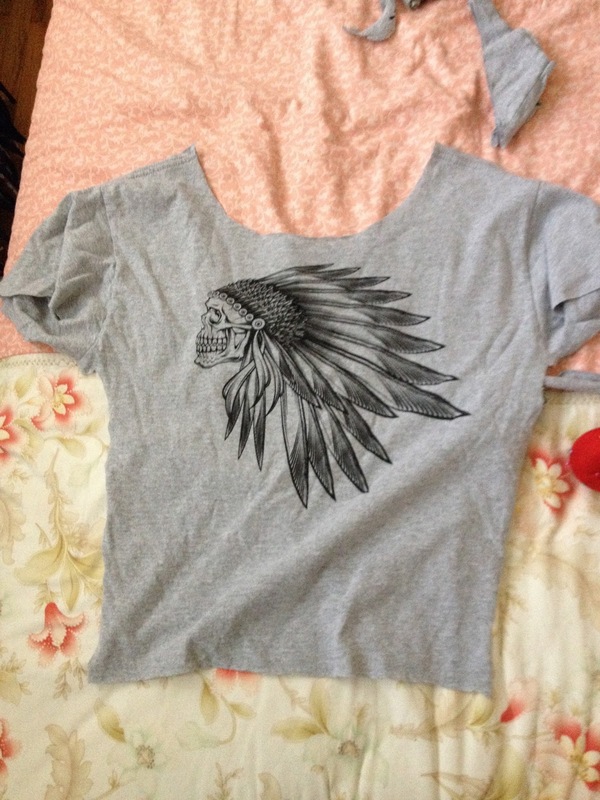 I saved the front and sleeves because I knew I could refashion it for myself somehow. I had another shirt just like this that he gave me that was black and gold and I transformed that into a cool skirt. The entire back is cut out of this shirt above. I had some cool, stretchy, fish net like fabric that I thought would look pretty cool on the back. Maybe giving it that Madonna 8o's meets grunge rock 90's kinda feel. I just laid the shirt onto the stretch fabric, cut it to fit, pinned, and sewed. It came together very easily. Ready to rock and roll this summer! 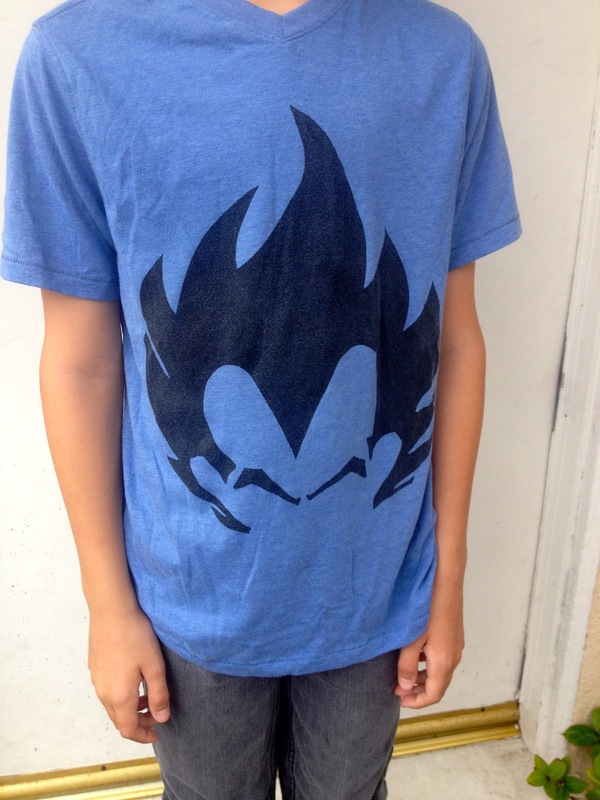 For my son, I transformed a plain blue shirt by adding a screen printed image of one of his favorite Dragonball characters, Vegeta. I did it the cheat way, with freezer paper. 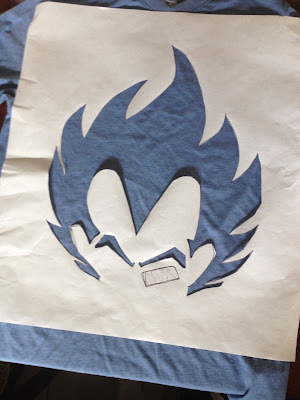 I did my best to draw an image onto freezer paper, then cut it out. 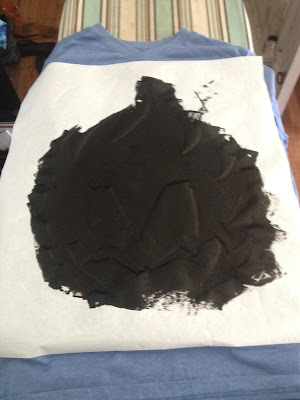 I ironed the freezer paper onto the shirt, then painted black screen printing ink onto it. 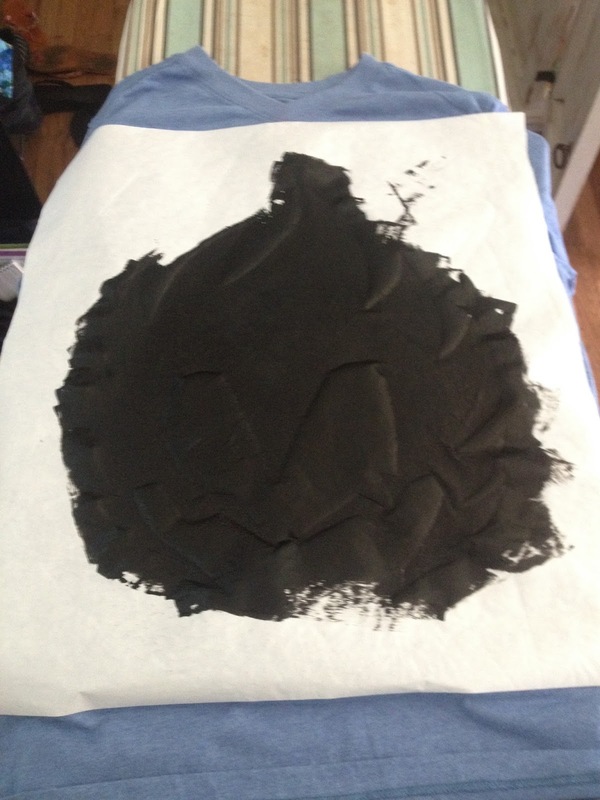 Once it dried, I ironed it with a dry iron and let it spin in the dryer for 5 minutes to set the ink. Here it is on! He loves it!! I can tell because it is the first shirt he picks out after laundry day :). 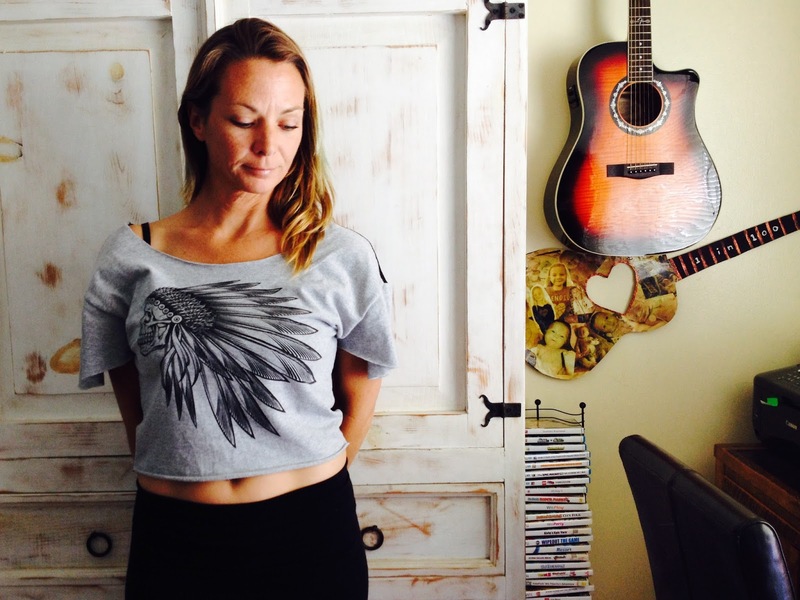 For my daughter, I had a plain black shirt I wanted to transform. 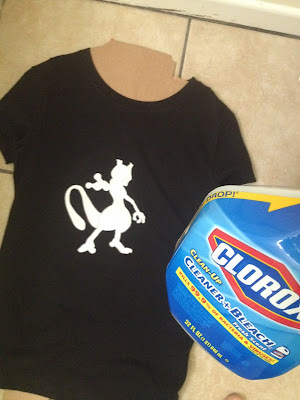 I had seen a lot of bleach shirt ideas on pinterest and wanted to try that out. The black shirt was my perfect opportunity. 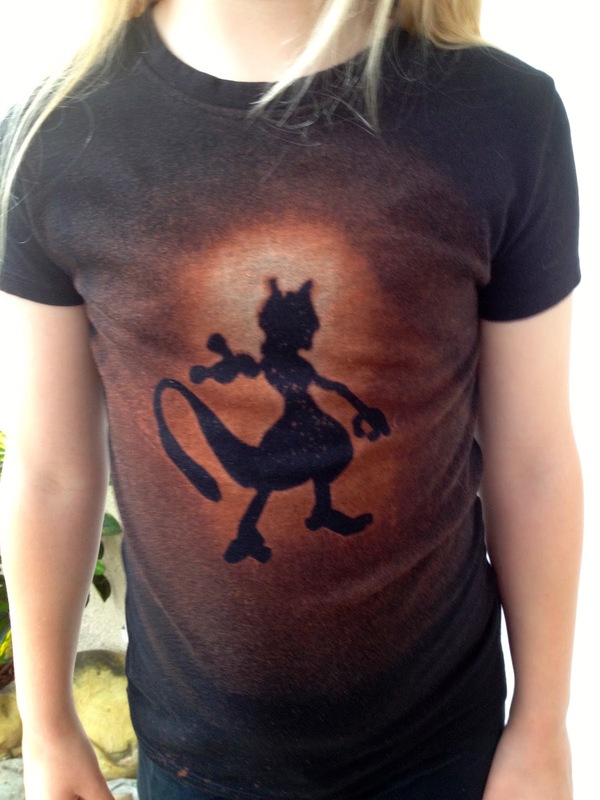 She loves pokemon, so I had her pick one of her favorites, Mew Two. I traced the image onto freezer paper, cut it out, and pressed it onto the shirt with an iron. I just used the bleach spray that I had on hand. It only took a few light sprays. You have to be careful not to saturate the freezer paper too much or the bleach will get under the image. Next time I might try to double up the freezer paper, I think that would work better. She loved it and so did her little pokemon loving friends at school. I tried to make something for my son using this technique on a red shirt, but the red really didn't respond that well to the bleach. It's probably best to stick to darker colors if you want to try this. 3 new, unique shirts, not too much trouble! Your t-shirts look great. I would love to know more about the freezer paper technique. Lovely technique! I've got to try it! Thanks!